The phenomenon of thermal trapping in a temperature gradient was first described by the German physiologist Carl Ludwig in 1856. The Swiss physicist Charles Soret later studied it in detail, and the effect is now named after him. Ludwig and Soret observed that molecules in solution always tend to collect at the cooler end of an imposed temperature gradient. The underlying physical phenomenon is now referred to as thermophoresis or thermodiffusion. “Even today, 150 years after its discovery, the basis for the effect is still not fully understood, but we’re working on it,” says Braun. But the fact that its underlying mechanism remains unclear hasn’t stopped him from exploiting thermophoresis in his own research. He makes use of the effect in the design of thermal molecule traps that function as evolution reactors. But he also realized that the phenomenon can be used to measure binding interactions between molecules. In 2008, two former doctoral students of his set out to commercialize the idea, and founded a start-up called Nanotemper, to build an analytical instrument for this purpose. The company now employs over 70 people. Braun meets the young entrepreneurs on a monthly basis to discuss the latest technical developments. Otherwise, he devotes his time to answering how life itself got started. Braun’s vertical thermal trap is subjected to a horizontal temperature gradient, and he believes that it provides a good model for an open water-filled pore in a rock. He compares thermophoresis with a paternoster elevator, whose passengers show a certain preference for boarding the downside of the system. “After a while, all of them end up in the basement.” Even minor temperature differences – on the order of a few degrees – between the sidewalls of his trap are sufficient to induce dissolved molecules to accumulate at the cooler side, and the effect becomes clearly discernible within 10 minutes or so. Informational molecules are not only held in place in the trap, they can also be replicated under these conditions, as Braun and his team recently showed in a paper published in Nature Chemistry. Double-stranded DNA molecules are separated into their constituent strands in the warmer zones, and a so-called convection current – a circular flow set up along the pore walls as a result of thermal expansion – transports the molecules into the cooler zone. Pairing of complementary sequences in different strands can occur here, and when the experimenters add the necessary building blocks and a replication enzyme, the shorter strand can be extended using the longer strand as a template. Thermophoresis then selectively concentrates the longer strands in the coolest corner at the bottom of the trap. This cycle allows the length and concentration of DNA strands to grow progressively, until the capacity of the pore is exceeded. They can then escape to seed new molecular communities elsewhere. In other words, as Braun points out, this laboratory system is capable of reproducing all the basic functions required for the establishment of an evolutionary process – replication, selection and feeding. But can we refer to a network of linked reactions in an open pore as a living system? After all, biological systems as we know them are based on cells, each bounded by a lipid membrane, which separates its inner workings from the environment. But chemical reactions can take place in the absence of such a boundary, but without concentrating the constituents, there is little chance for molecules to interact, cooperate and produce more complex systems. This in turn means that the selective forces acting on the biochemical information are limited – and reproduction and the transmission of hereditary information are crucial hallmarks of life. Braun‘s work shows that such processes can be realized in the absence of lipid membranes. In his system the pore walls provide the boundary between inside and outside. “A lipid sac is energetically expensive to maintain and is inhibiting many reactions,” he says. This is why he believes that biological membranes evolved after the first informational molecules. At all events, Braun‘s molecule traps provide a setting in which membranes can be assembled, as work by Jack Szostak at Harvard Medical School in Boston has recently shown. He added small amounts of lipids in very low concentration to such a thermal trap and observed the formation of so-called vesicles – tiny compartments bounded by a lipid bilayer, which can be regarded as very simple versions of biological membranes, formed at the cold end of the trap. Szostak won the Nobel Prize in Medicine in 2009 for other work, but then began to explore aspects of the origin of life. In addition to membrane formation, he has also investigated the evolution of self-replicating and catalytic RNA molecules in the test tube. Therefore replicating systems encapsulated in membrane vesicles could have succeeded the protocells which, in Braun’s scenario, developed in tiny cavities in warm rock. And with these protective and deformable coats, the first cells would have become mobile. And subsequently, these simple systems must have given rise to the first true bacteria, which were capable of replicating and transmitting their informational molecules to their daughter cells by an ordered process of cell division. Following the establishment of the cell theory in the early 19th century, biologists generally believed that the first unicellular organisms had arisen spontaneously on the early Earth. But in the wake of Darwin’s theory of the origin of species published in 1859, the less idealistic notion that a phase of chemical evolution must have preceded the emergence of the first self-replicating cells came to the fore. But for almost a century, no one imagined that the earliest steps in the origin of life could ever be reconstructed. But in 1952, a young chemistry student called Stanley Miller carried out one of the most famous experiments in the history of science. He added water, ammonia, methane and hydrogen gas to a round-bottomed flask, connected it to a second vessel into which he had inserted two tungsten electrodes, and placed the whole assembly on a Bunsen burner. Then he connected the electrodes to the mains, causing them to produce static discharges. The idea was to simulate the conditions that were then thought to have existed on Earth 4 billion years ago: a hot primeval ocean and a toxic atmosphere racked by thunderstorms. By the 7th day, the “ocean” had turned red and the inner surface of the lower vessel was coated with a yellow slime. This was the first experimental realization of the so-called Ursuppe in which all biological macromolecules, and the first cells, were thought to have formed. After preparation protocols, Miller identified 7 amino acids in this first experiment, and later experiments produced up to 17 of the 20 different building blocks found in cellular proteins today. Nowadays, most geologists agree that Miller’s simulations were based on false premises. Earth’s atmosphere 4 billion years ago was probably far less corrosive than the gas mixture used by Miller. Nevertheless, as the first attempt to experimentally simulate prebiotic conditions, his work was a milestone. “Indeed, at the time, the experiment was regarded as hubris presumptuous, but Miller paved the way for everything that followed,” Braun says. And the work demonstrated that the building blocks of life could be produced from inorganic compounds. Is life the product of a freak event? Stanley Miller was the first to formulate and test a plausible hypothesis about how life’s essential components, amino acids and nucleotides, could have been synthesized in prebiotic times, and others have followed him. Braun, on the other hand, seeks to close the gap between the first biomolecules and the first organisms. And his thermal-trap idea is currently one of the best available models for that process. It is unlikely that we will ever be able to conclusively define how life actually originated on Earth, Braun emphatically rejects the suggestion that a complete molecular starter kit for life was delivered from another planet by a meteorite. It is clear that simple chemicals like water and other elementary ingredients of life reached the Earth from space. But Braun thinks it unlikely that delicate biomolecules could have survived such a journey and – above all – the hard landing that ended it. “If the Universe were significantly older than we now know it to be, I would have no objection to the idea that life could have arrived here from elsewhere.” Given enough time, such a highly improbable event could have occurred. “But the Universe is not much more than twice as old as our planet. That’s not enough time to accommodate such a freak event,” he says. And if the Earth provided all the necessary prerequisites for the evolution of life, he says, this also implies that analogous processes could have taken place on any other planet on which similar conditions existed: porous rock, water, a few simple chemical compounds, not too near and not too far from the closest star. “Astronomers are now finding such Earth-like planets. We will never be able to reach them, but it is likely that comparable processes have taken and are taking place elsewhere. So far, research on the origins of life on Earth has been dominated by chemists. Physicists like Braun have rarely ventured into the area, and tend to be viewed rather skeptically. But it probably takes a physicist’s intuition to recognize that previous scenarios have lacked a vital physical mechanism. 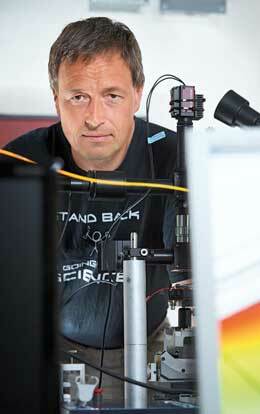 Prof. Dr. Dieter Braun is Professor of Systems Biophysics at LMU since 2007. Born in 1970, Braun studied physics at Ulm University and at the TU in Munich. He did his doctoral work at the Max Planck Institute for Biochemistry in Martinsried, before going to Rockefeller University in New York as a postdoc. From 2003 to 2007, he headed a DFG-funded Emmy Noether Junior Research Group, and in 2010 he won of the prestigious Starting Grant awarded by the European Research Council (ERC). Since 2014, the Simons Foundation in New York has also funded his work. LMU researchers have set up a new transdisciplinary research network devoted to the experimental study of the origins of life. The Origin of Life Initiative Munich (OLIM) brings together specialists in various disciplines who seek to understand the processes which led to the emergence of systems that exhibited evolutionary dynamics, and initiated the transformation of a dead planet into the rich biosphere we observe today. The network is based at LMU, where teams at the Center for Nanoscience (CeNS) and the Nanosystems Initiative Munich (NIM) have been exploring related issues for several years. Researchers from the Technical University of Munich (TUM) and the Max Planck Institutes located in Munich will also participate in the new network.